Georgia Politicians are Attacking Unemployed Workers Once Again! Today, the Georgia State Senate introduced SB 227 an all out attack on unemployed workers in Georgia. SB 227 w​ould make the unemployment benefit cuts imposed by GA Labor Commissioner Mark Butler permanent into state​ law. Furthermore, SB 227 ​would ​expand these cuts not only to school workers, but to all contract and seasonal employees across GA, forcing many into unstable employment​. These cuts originally imposed by Mark Butler, have put workers in a dire situation. Ever since the cuts were enacted, workers have struggled to put food on the table to feed their families, have not been able to afford medical care, and some have even been evicted from their homes. 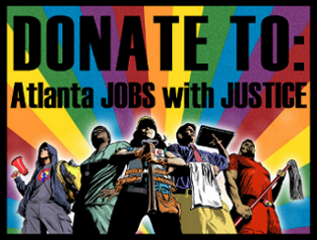 We at Atlanta Jobs with Justice ask you to stand with these workers who have lost so much as it is. We need to stand up to our representatives and prevent them from making this situation permanent for thousands of workers in Georgia. Please click here to send these s​enators and your representatives a message that you oppose SB 227 and the cuts in unemployment benefits.